Plans to completely revamp Stadion Dinama were announced in 2012. In early 2013 GMP Architekten of Germany were announced as winners of the international competition to redesign the stadium. Within the historical bowl new stands were planned, changing layout from athletic to football-specific. The plan had an impressive aesthetic form with wavy, white membrane planned atop the historical arcades to cover additional seating. Capacity was to reach 40,000. That plan is no more. It was dropped in 2013, as the demolition of old stands was already ongoing. Authorities in Minsk now envisage two smaller stadiums instead. 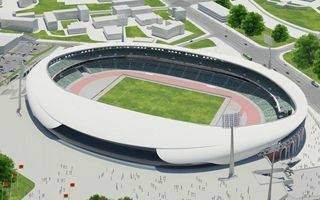 Stadion Dinama was redesigned by local UP Minskproekt to hold 20,000 people and accommodate all major athletic events expected in Belarus, like the 2019 European Youth Olympic Festival hoped to take place in Minsk. Aesthetically a lot changed. Old floodlight masts will remain untouched, while double-tiered stands will get partial cover with a futuristic touch. West stand will also provide extensive training infrastructure along with hospitality facilities and offices. The above plan for Stadion Dinama has one major disadvantage: it’s not eligible to apply for Euro 2020 games, which Belarus hopes to be a venue for. This is why a completely new football-specific national stadium is planned in south-eastern Minsk, right beside the existing Stadion Traktor. Initial concept by GMP Architekten may be viewed below, but private company Tripla (owned by Yuri Chyzh just like Dinamo Minsk itself) stresses the shape may change as final documentation isn’t ready yet. The stadium may have an angular shape with a large LED façade directed at the centre of Minsk, where most people are to come from on matchdays. The stadium needs to have at least 30,000 permanent seats to apply for Euro 2020 and get underway in 2016 at the latest. Tripla expect the price to be around €100 million, but this number is also only a rough estimate.